BetOnline.ag is a well-designed digital gamblers den that has everything you need to feel the excitement you’re looking for. One of the most popular and reliable horse betting sites on the internet today, they also feature a full online casino that has a great deal of incredible promotions, video poker, table games, along with skill games and even 3d slots. Their sportsbook is vast and easy to use and has live betting for those intense gamechangers that no one can predict. Sportsbetting.ag has been online since 2004 and has origins through a parent company all the way back to 1991. A proud and consistent online gambling source, they have been known for speedy payouts, exceptional customer service and modernized interface that makes the website easy to use. What Types of Bonuses, Promotions and Incentives Are Available At BetOnline? Customers are initially eligible for two bonuses right at the instant that they sign up. As a welcome bonus to the sportsbook they will match 50% of your initial deposit and add that to your bankroll to beet with. They also offer a 25% lifetime bonus guarantee whenever you make a qualifying deposit you just simply enter in the promocode and gain and extra 25% of your deposit. Along with the usual refer-a-fried bonus, there are dozens of other promotions and incentives accessible on the website for the various other parts of the website as well. Is It Legal To Bet on MMA Fights at BetOnline? Yes. BetOnline is one of the only providers in the world to offer their gambling services unrestricted around the globe. United States federal laws like The Federal Wire Act, and The Professional and Amateur Sports Protection Act place restrictions on internet sports gambling and require that the company who hosts the gambling to be based outside of the United States. Betonline.ag is in perfect accordance with this, being located in, and properly licensed and regulated through Panama City, Panama. Betting on mixed martial arts on BetOnline.ag is simple and straight to the point. Once you navigate to the money lines in the sportsbook, the odds are displayed for you for each fighter right there in the middle of the page. They list typical match-bets along with over/under bets further down the row. They allow for up to 15 parlay bets a time and even have prop bets on whether certain fights are even going to happen. Like the Conor McGregor vs. Nate Diaz rubber match. As a mixed martial arts fan, there is a little disappointment in this sports book. Although they have more betting options than other US-friendly sportsbooks, they tend to only have a few fights for each card. The number of fights in which they cover per card seems to vary wildly and randomly. For instance, For UFC 208 they host betting lines for the main event between Germaine De Randamie and Holly Holm. However, for UFC 209 they have 2 fights listed on the sportsbook and for the UFC Fight Night 104 they have 6. I’m not sure how they choose which fights to include but it seems to be true that they at least have all the main events. 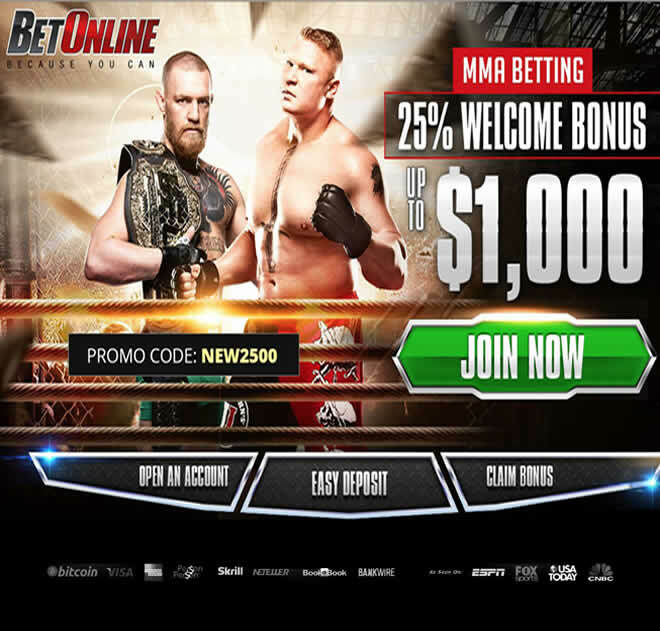 Does BetOnline Offer Mobile MMA Betting Options? Yes, you can logon to BetOnline.ag from anywhere using any device that has internet access. Just use your device’s browser and type in BetOnline.ag which will redirect you to mobile.betonline.ag and you will access to your account and everything that the site has to offer right there from your mobile device. Is Live MMA Betting Available At BetOnline? For those intense, game-changing moments that also change your bets, BetOnline.ag offers live betting for you to add a dynamic new way to enjoy your sports. They offer a wide variety of live betting on sports and we would recommend that you check with their live betting app at the time of the fights you want to bet on to see if they offer this for your event. For over 10 years, BetOnline has been establishing a status of credibility and character among its worldly customers. Their certificate compliance which has been validated by third party tech centers to have met international standards on the fair practice of online gaming. In accordance with US federal law, BetOnline.ag is based out of Panama City, Panama and is legally licensed and regulated for international online gambling activity from all over the world, Including every state in the United States. The banking options at BetOnline.ag are vast. They try and make it as easy for you as possible so you’re not left wishing there was a way. They accept money orders, cashier’s checks, book-to-book wire transfers along with person-to-person money transfers from multiple providers, Bitcoin and all major credit cards. For withdrawing money for a payout, they also offer various methods and numerous fees associated with them. You can choose to have your winnings set to you by means of express check with a processing fee of $50. Or, a Bank wire or a MoneyGram sent that comes at a fee that’s relative to the amount being sent. Or a check sent by courier which is relatively the cheapest option at $35. Or, of course, you can have it sent to your eWallet through Bitcoin for free! What Type of Security Is In Place At BetOnline? BetOnline.ag takes great pride in their advanced security protocols. They boast secure servers that hold an SSL data encryption as you can plainly see by the icon at the footer of their website. They have top-notch anti-virus software and firewalls set up to stop any potential damaging attacks on their online network. A team of technical experts are on-call 24 hours a day and work with advanced fraud protection software to keep their customers and themselves safe. BetOnline.ag also uses a third-party security team who work to audit their security protocols and search for weaknesses in them. After being in the online gambling world for over 10 years, BetOnline.ag has developed a rigorous security profile and excellent customer service standards, which is why we have chosen to review them. BetOnline.ag is an all-in-one online casino with a sportsbook, racebook, and even stock market betting. The website offers advanced options like live-betting and is completely mobile friendly so you make sure the odds are still in your favor from your mobile device. With the most current money lines, BetOnline also has more betting options for MMA than other websites that we have reviewed. Right on the same row as the money line you can choose to bet on the match-up and the over/under on round times. They also allow you to parlay a UFC fight card over multiple events and for as many as 15 bets at a time. They have a few prop bets available as well and every option you can think of for depositing and withdrawing funds to and from your account. It’s clear that BetOnline.ag has established their credibility throughout the years and has become a leading name in online gambling.